Taking the ITM vertical debt spread idea a little farther, here is an example. Best returns appear to be on the leveraged products but higher risk, obvious with the higher premiums. Here is a TQQQ example. 10 point spread, 20 DTE, 10 lot $1350 profit, max loss 8650 if you don’t manage it, and it is 33 points ITM now. Could it hit the short strike, possibly but would require more than a Feb 6 event to get there. The more I look at these, the more I like. Easy to roll to #fuzzy if needed. Set up a ladder and would be a good income stream. Thoughts, other comments, see anything I am missing? I have an ERX one on now, it was challenged last week but never hit the break even point. I will likely roll it 3 weeks out this Thurs. or Fri. to avoid the assignment fees as long as it will close at or a few pennies shy of 5. If not will let it expire. Wife is already asleep, daughter has a friend over so looking at some possible trade ideas. Taking the ITM debit spread a step further here are some numbers to consider. Based on closing prices all 22 DTE so we are comparing apples to apples. TNA as example, this is leveraged but with excellent weekly premiums. 10 contracts on all to keep the numbers consistent. These are all about 6 points ITM on the call side or 6 points OTM for the puts. 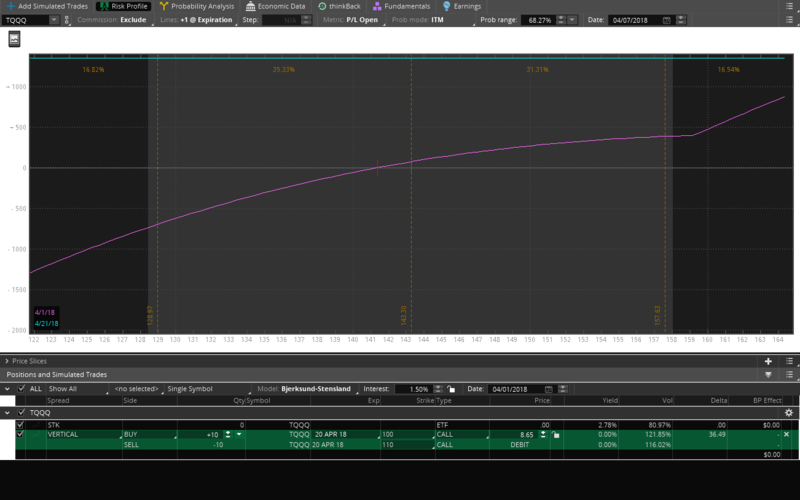 50/60 vertical debit spread cost 8.95 for a 10 point spread at expiration. Max profit $1050. Max loss $8950 but this can be converted. 11.7% ROC for a 140.4% annualized return. 60 strike CC 58.22. Max profit $1780. Max loss 58,220 for 3% ROC or 36% annualized. 60 put requires full cash secured because leveraged. 54,471 at risk for $1020 max profit, 1.87% return or 22% annualized. All could be rolled or hedged if needed. I am going to experiment more with these, like the idea, the returns, limited risk and can be done in a smaller account. Also could set up a ladder for an income stream. Right now have ERX going, may add FAS and TNA in small contract size in a few weeks. $SPX 2585/2610 What a year and it is only three months long. Have a great Easter/Passover. Three days to enjoy on hopefully, a high note for all. #Fuzzy – STO XBI Apr06’18 91 calls for 0.47. Enjoy the long weekend everyone! Resting up…16 underlyings with expirations next week. Gonna be fun! Wednesday: BTC $BABA Apr 20 2.10 call for .35. Sold for 2.90 on Mar 15th. BTC BABA Apr 13th 205 call for .20. Sold for 2.05 on Mar 6th.